Like other artists who became known by the place of their origin, Michelangelo Merisi was called “Caravaggio,” the Italian city of his birth. After studying art in Milan, Caravaggio went to Rome at age twenty and, after three years of poverty, his fortune changed when a few of his paintings were bought by the influential Cardinal del Monte; this led to other important commissions. During the Renaissance in Rome, heroic events were painted and subjects seemed to exist in a lofty idealized classical world – an “art” world. Artists of the century that followed painted in the “manner” of the Renaissance but seemed to lack a guiding direction; often virtuosity was substituted for substance. By the time Caravaggio went to Rome almost a hundred years had passed since the High Renaissance and he was neither smothered by its idealism nor enamored with the exaggerations of the Mannerists. Instead, he brought naturalism into his work. His models often were selected from earthy low life people of the streets and Caravaggio painted them as they were (dirty feet, fingernails, and all). Prettiness did not interest him. 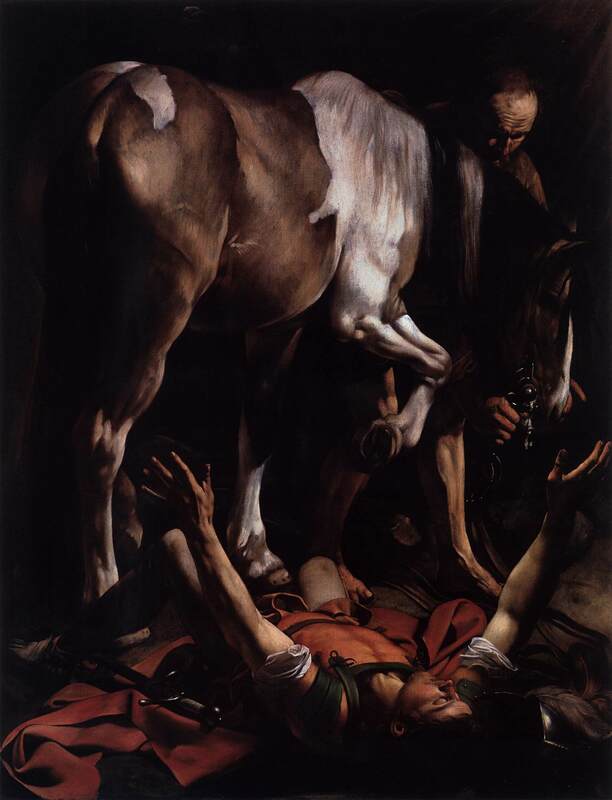 Caravaggio’s “Conversion” depicts Paul as a young armored soldier who had been traveling by horseback on his way to persecute Christians in Damascus. The painting gives us the moment a blinding light struck Paul and caused him to fall to the ground. In this unusual arrangement of images, the upper portion of the painting is dominated by nothing more than the body of Paul’s horse. A companion, who is mostly in shadow, has a hand on its bridle. In the center are numerous legs; portions of which are highlighted by the intense light and Paul is at the very bottom lying helpless. When an artist is organizing a composition, the principal subject is placed usually in a prominent position but Caravaggio’s painting limits the physical space given to Paul. About two-thirds of the way down, a foreshortened Paul is flat on his back. His sword is off to one side, his helmet has fallen from his head and his arms are raised as though he is confused by the suddenness of what happened. Caravaggio’s use of extreme contrast keeps our attention in the foreground; there is no middle ground or background and we are not able to enter visually the dark areas of the painting. He keeps our focus directly on the event. Caravaggio’s genius was in identifying with his subjects and in having an ability to communicate the feelings they were experiencing. In his personal life, Caravaggio was in constant trouble with authorities and was not a person you would want to meet. He was in arguments and brawls frequently, and after one of his fights the person he struck died. He fled from place to place but high regard for his art brought commissions and he painted masterpieces of dramatic impact even as he ran from the law. Next Next post: Prayers to begin, but what is to follow?